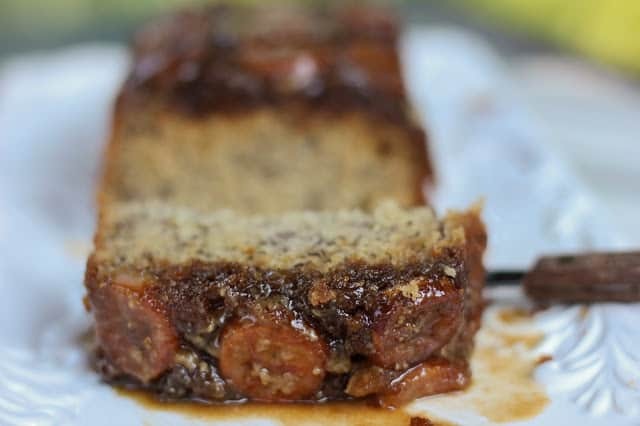 This Caramel Banana Upside Down Bread is so pretty but so easy to make! It’s a bread…no it’s a cake! It taste like cake to me…like really, really good cake but it’s cooked in a loaf pan so it’s bread? I really don’t know and don’t care…I just love it! Preheat the oven to 325 degrees F. Grease a 9X5 inch loaf pan. Spread the brown sugar on the bottom of the loaf pan. If using nuts, sprinkle them evenly over the sugar. Dot with the butter. Put it in the oven for about 8 minutes. Stir the mixture until dissolved and spread evenly on the bottom of the pan. Place a single layer of the banana slices on top of the sugar mixture along the entire bottom of the pan. In an oven preheated to 325 degrees F, bake for 1 hour or until a toothpick inserted into the middle of the loaf comes out clean but moist.